Ok, I do not know what "randomness" you are talking about even after reading your whole post 5 times. Because it always boggles my mind why you have to go do all the setup you outlined when you do not want to communicate via Gajim. Your whole post is shouting "I do not want my friends to communicate with me via Gajim" then do not login Gajim, use Gmail. Care to explain what you have in mind more clearly? Why you want to be online in Gajim when you do not want your friends to contact you via Gajim? Okay, let me explain the "randomness" first. Let's say I log into chat from Gmail and set my status to "google client". This status message will be propagated among all Google clients, so my Android phone picks it up too. Then I open Gajim and log in. It retains the status message that I had set in the previous day (let's say it was "feeling sleepy"). 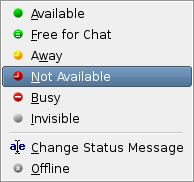 Since Gajim's default priority is 50, all my contacts would see my status message as "feeling sleepy". 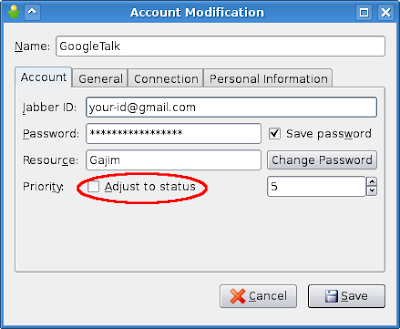 I am away from my computer, and so Gmail and Gajim both go idle; but Google Talk client on my Android phone is not idle. My contacts now see "google client" as my status message. I'm back on my computer and the status message is "feeling sleepy" again. For me, having one status message everywhere is important. Setting my status to "Not Available" on Gajim seems to help. Besides, the point of the whole post is not to complain: it is to show how I personally use Gajim. Maybe there are people who have the same needs as I do, and they might find this post useful. 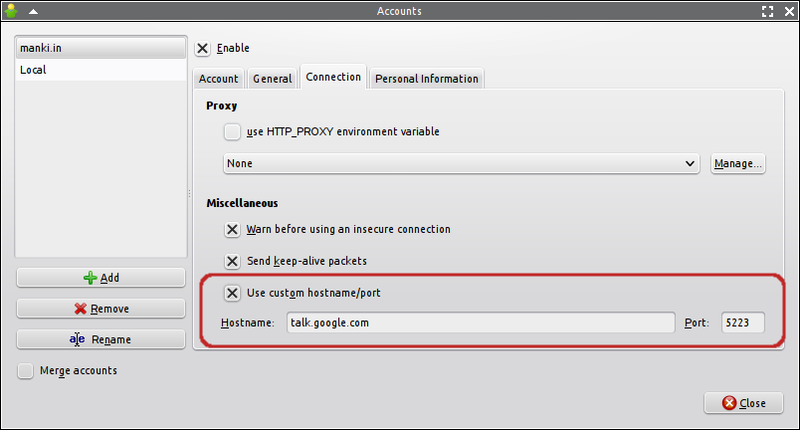 In my opinion, Gajim is the best XMPP client available on Linux. 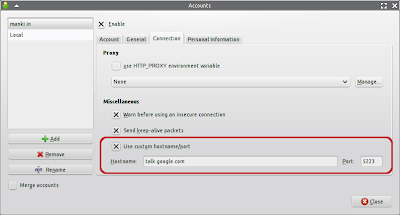 Although I am using host as talk.google.com and port as 5223 or 5222, it says Insecure connection alert and does not connect to gtalk. Please advice.